The plants proved mutually beneficial: the tall corn supported the climbing beans; the beans added nitrogen to the soil, providing nutrients for the corn; and the low-growing squash vines served as a living mulch, preventing weeds while retaining moisture. Companion planting is a great way to pack lots of veggies into a small space, but it also serves many other purposes in an organic garden. Scent attracts many pests to their host plants. Insects lay eggs on the host plant, knowing that the plant will provide food for the newly hatched larvae. By interplanting strongly scented herbs and flowers among crops in the vegetable garden, pests become confused, which means they leave your future dinner in peace. However, French marigolds win the prize as companion-planting champs. They deter Mexican bean beetles, aphids, potato bugs, squash bugs, and nematodes (microscopic roundworms in the soil that damage many plants). Plus, they add a beautiful burst of color to the garden. After all, an organic edible garden should be lovely to look at, too. Not all insects are bad. Along with repelling pests in the garden, it’s also important to attract beneficial insects. Beneficial insects serve many purposes. Bees, butterflies, and some beetles provide pollination, which increases harvests. Besides pollination, many beneficial insects feast on pests, making your work easier. For instance, when you find a tomato hornworm happily snacking on your beautiful heirloom tomatoes, have you noticed small white spikes on its back? Those small spikes are actually killing the hornworm—organically. Parasitic wasps lay eggs on the hornworm, and as the eggs hatch, the larvae feed on the hornworm, eliminating your garden nemesis without an ounce of pesticide. 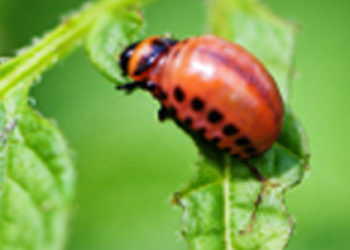 Ladybugs: both the larvae and adults eat aphids, small caterpillars, and pest eggs. Braconid wasps: a parasitic beneficial insect, it lays its eggs on host insects. When the larvae hatch, they consume the host insect, killing it. Hover fly: larvae eat mealybugs, small caterpillars, and aphids. Lacewings: larvae eat aphids, small caterpillars and caterpillar eggs, small beetles, and insect eggs. Remember to include a succession of blooms so that beneficial insects visit your garden spring, summer, and fall—and winter in mild climates. Feed your flowers and crops with something like Espoma Flower-tone 3-4-5 to keep plants healthy and productive. While we often think of companion planting primarily as a method of pest control, companion planting also improves harvest flavors—and even yields. For instance, in a limited-space garden, combining tall, sun-loving crops, like tomatoes, with shorter plants that enjoy a bit of shade in the heat, like lettuce, allows maximum use of space in a 4′ x 4′ raised bed. Add nasturtiums to your bed, and now you have beautiful, edible flowers to brighten your meals. Place a trellis for cucumbers along the back edge of the raised bed, and you’ve added another treat for your organic salad. The nasturtiums entice pollinators to visit, increasing the yield of your tomatoes and cucumbers, plus they serve as a trap crop for aphids, protecting your harvest. Add a few radish seeds near the lettuce. Not only do radishes and lettuce grow quickly, but the lettuce protects the flavor of radishes in summer when they can turn bitter. Add a dill plant or two in the corner, and encourage braconid wasps to hunt tomato hornworms for their nursery. You’re protecting the tomatoes while growing an ingredient to add to a homemade salad dressing. Perhaps you want to create a pretty, edible container garden. For a cool season combination, plant kale as a “thriller”—the central, taller plant in the combination. Add aromatic herbs, like sage, to protect the kale from cabbage moths as your “filler.” Finally, plant pollinator-friendly violas along the edge of the container as the “spiller.” The violas will tumble over the edge of the container as they grow, attracting pollinators and adding aesthetic appeal—and the flowers add a lovely, edible ingredient to meals. 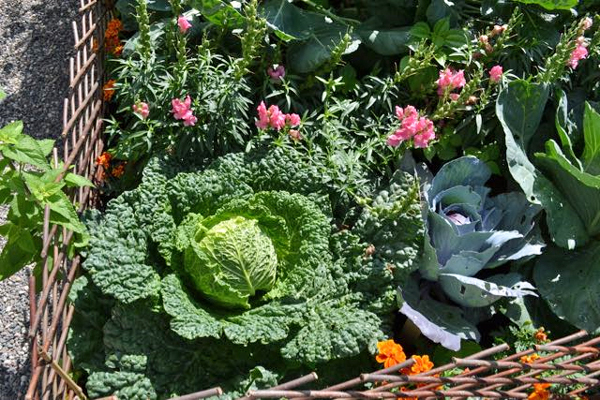 Companion planting packs many benefits into a small space. It does require a bit of thought about your garden. What crops will you grow? What pests also enjoy the same food you do? Which plants can help you fight off the bad guys while attracting the good insects? The time spent planning your companion plantings is worth it. Adding beautiful, beneficial flowering plants into your garden plan is much tastier than eating a toxic dressing of pesticide on your produce, don’t you agree? All of our herbs and vegetables are organically grown and we only carry the best varieties. Want to get started with companion planting? Visit our store.